00:11:00 Makes 1 serving, one sandwich (96 g). Makes 1 serving, one sandwich (96 g). Looking for a great grilled cheese sandwich? 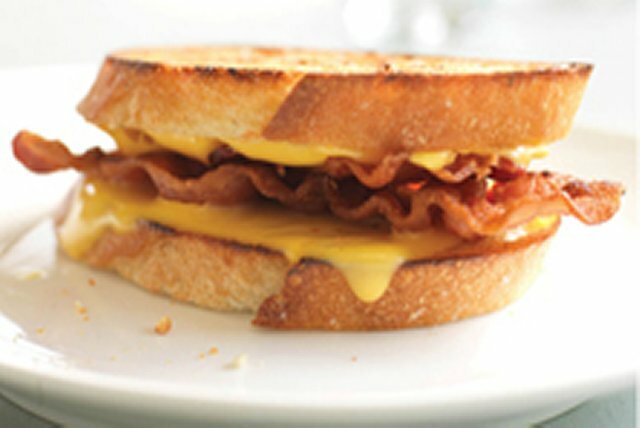 This one is a bacon and cheese sandwich warmed in a skillet until the cheese is melted and the bread is golden brown. Top 1 of the bread slices with Singles and bacon; cover with remaining bread slice. When preparing sandwiches for a crowd, place prepared sandwiches on baking sheet. Bake at 400°F for 6 min. on each side or until golden brown on both sides. Serving Size Makes 1 serving, one sandwich (96 g).